Blackwater Gulch Kickstarter project ends Tomorrow! Blackwater Gulch by Gangfight Games is having their last days on Kickstarter. The Blackwater Gulch Kickstarter will end on Sunday, April 15th at 10 PM Eastern (New York) time. First, I wanted to say thank you again to all of you who are interested in the project. It's been more successful than I ever imagined. Now down to business! 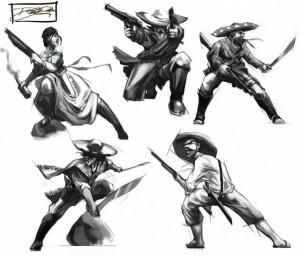 I have all of the concept art done for the Bandidos Mexicanos now. These were done by Don Ellis Aguillo. The concepts for the other gangs are all done, and on the Kickstarter page now. Many have asked to increase the amount of sold out backing levels that include building kits, so as a sort of "End Of The Kickstarter Blowout Extravaganza" I'm going to be freeing up a bunch of extra slots in those sold out spots. And while i'm fresh out of new ideas for stretch goals, and there's only a couple of days left anyway, I'm just going to let it ride and see how we do at the end. Keep in mind, for every $1500 raised, you get an extra Sheriff Die .. as of this moment, everyone is getting 11 dice, at $18,000 it will be an even 12, and so on! For those of you that may want even more dice, you can add extra money to your pledge, an extra $3 for 4 dice (75 cents each, but I think Kickstarter only lets you add dollars).